Capacity utilization at Toyota’s Georgetown, KY, plant where Camry is built remains at 85%, Lentz says. The midsize car segment of about 1.8 million units, plus the compact segment, which accounts for another 1.8 million units, remain substantial and very attractive targets, says Toyota North America’s CEO. DETROIT – Toyota has every intention of remaining a “full-line manufacturer” of cars and truck in the U.S. even as demand shrinks for sedans and compact cars. 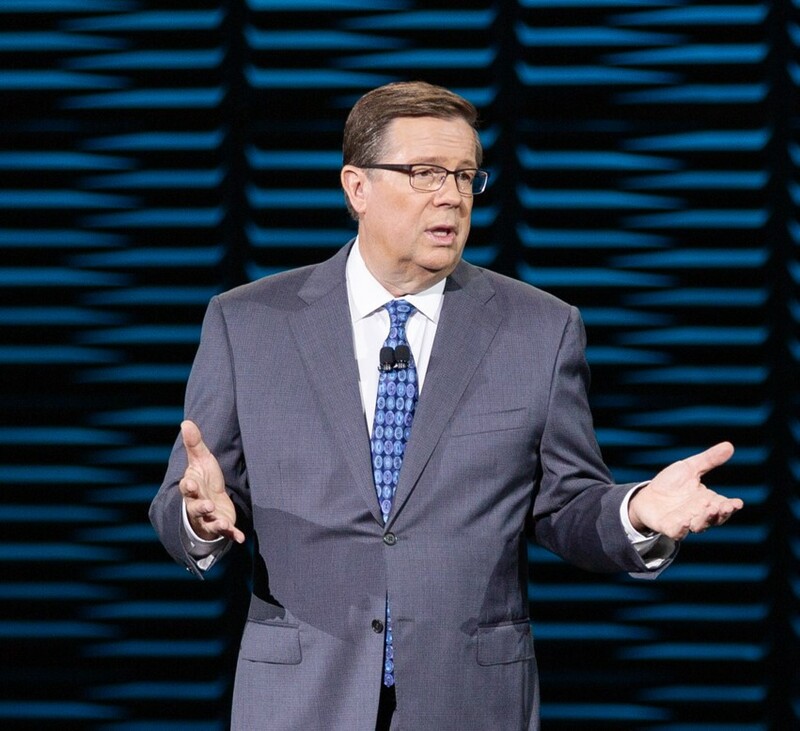 Jim Lentz, chief executive officer of Toyota North America, says in an appearance at the Detroit Economic Club Toyota is mindful of the trends that have sharply reduced sales of passenger cars in the U.S. In fact, sales of passenger cars in the U.S. have dropped to levels below those seen during the Great Recession of 2008-2009. The market demand appears headed for equilibrium with passenger cars accounting for about 30% of all sales in the U.S. Light trucks, vans and utility vehicles are expected to account for the other 70% of new vehicle sales, Lentz says. The midsize segment of about 1.8 million units, plus the compact segment, which accounts for another 1.8 million units, remain substantial and very attractive targets, Lentz says. In addition, those sectors play to Toyota’s traditional strengths. “I think you’ll see Honda making cars as well,” he says. Lentz says capacity utilization at Toyota’s Georgetown, KY, plant where the Camry and Avalon are built, was holding at 85% but had slipped to about 78% at the plant in Blue Springs, MS, where the Corolla is assembled. The Mississippi plant is scheduled to begin building the next-generation Corolla in spring. Toyota’s North American rivals such Ford, FCA US and General Motors, are in the process of shifting away from passenger cars. At the same time, competition is intensifying in areas such as compact pickup trucks, a segment Toyota dominates with the Tacoma. Lentz (pictured below, left) also says Toyota doesn’t foresee the need for trimming or reorganizing its white-collar staff of about 12,000 people. “We already did that with the move to Plano,” Lentz says. The move of Toyota’s new headquarters from California to near Dallas was completed in 2017 and allowed for the consolidation under one roof of four distinct units, including Toyota’s North American manufacturing arm, sales, finance and Toyota’s holding company. The change allowed for consolidation of duplicate functions in many areas and opened the door for retraining personnel who might have been forced out in a typical corporate reorganization. Lentz also stresses during his remarks that tariffs remain a serious threat to the auto industry by forcing manufacturers to raise prices on new cars and trucks. In turn, rising prices could reduce consumer demand, crippling the U.S. auto industry, Lentz says. Toyota expects strong sales again in 2019 of 17 million units, but higher tariffs could cut overall demand by as many as 2 million units, he suggests. The tariff threat is coming from two different directions, Lentz says. One is from the so-called “232 Investigation” being conducted by the U.S. Dept. of Commerce, which is expected to rule on whether imported cars and car parts are a threat to U.S. national security. Roughly 25% of the components of every car assembled in the U.S., Canada and Mexico come from beyond the NAFTA region, so tariffs would have a big impact on the U.S. economy, driving up the price for consumers and reducing sales of new vehicles significantly. In the case of Toyota, higher tariffs on imported parts could boost the price of a Camry assembled in Kentucky by $1,800 while the cost of Toyota’s Tundra pickup truck assembled in Texas would increase $2,800, Lentz says. The other threat comes from pulling the U.S. out of NAFTA. Abandoning the structure offered by NAFTA also damages the U.S. auto industry, Lentz says. President Donald Trump has called for approval of the new U.S. Mexico and Canada Agreement as a replacement for NAFTA, but Congressional Democrats have balked, citing the need for tougher environmental and labor rights provisions.